You'll enjoy the ultimate in convenience when loading or unloading passengers or cargo. Open the hands-free liftgate by simply tapping your foot underneath the sensors. Operation of the side sliding doors is similar. Just make sure you have your key fob on you and tap your foot under the door to load passengers with ease. You won't find a more attractive vehicle on the road as the Pacifica gives you a selection of eye-popping colors. You'll also enjoy your choice of wheels, ranging from 17 inches to 20 inches. 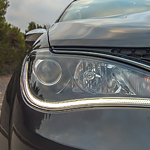 Daytime running lights also help illuminate the road in front.